Malvern's water pours copiously from numerous water spouts and taps around the hills, and has been until the end of 2010 bottled from the Primeswell Spring and distributed worldwide by the Coca-Cola & Schweppes Company as the water "malvern". Before production ceased, the local bottling plant at Colwall processed about 12 million litres of water a year. More recently, the water from the Holywell Spring has been bottled and marketed as the premium Holywell Spring Water, and is now on sale in Regents Cafe on Westminster Bank in West Malvern and the Great Malvern branch of Waitrose supermarkets. It also appears on the table at quality restaurants. Visitors drive from miles around with empty bottles to fill-up-for-free on the hills from the road side. The water has been praised by many famous people through the ages for providing healing and well-being properties, including Charles Darwin and Charles Dickens, both of whom visited the town frequently to relax and drink from the springs. The water was also supplied to the present Queen, having been granted a royal warrant by Princess Mary Adelaide in 1895 and later, in 1911, by King George V, although with the recent closure of Malvern Water bottling plant, this situation has changed. Dr John Wall's analysis of Malvern water in 1756 was the start of Malvern's national fame as a hydrotherepy centre. This reached its peak in the mid 1800s as various doctors, most famously Drs Wilson and Gully, set up clinics in Malvern for wealthy Victorians. Today, for your own piece of the 'water cure', you can buy handmade soap and SkinnyDip hand cream; both products being made using Malvern's spring water. 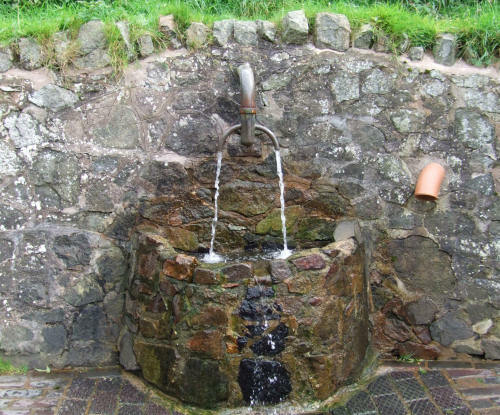 The wells, springs, spouts, and fountains around the Malvern Hills are now restored and conserved by The Malvern Spa Association which was founded in September 1998. Each year, over the May Day weekend, the wells of Malvern are dressed (decorated) according to a theme chosen by the Malvern Spa Association. This practice reflects an ancient tradition of dressing the Holy Well in the 12th and 13th centuries to thank St Oswald for water cures there. Modern Malvern well dressing involves about 100 people from different community groups dressing more than 20 sites, with a prize awarded for the best dressed well. The map shows the location of the 'malvern' water bottling plant at The Springs, Walwyn Road, Colwall, WR13 6QQ (bottling operation ceased 2010).